British football had a torrid time throughout the 1980s. Football hooliganism, rife throughout the terraces, had culminated in the Heysel disaster and the terrible organisation of matches resulted in the Hillsborough tragedy. A dark, grieving shadow had enveloped British football, so was it any surprise that attendances were dwindling and fans were hated?. British football dragged itself into the 1990s facing an uncertain future, but a revitalising change was hovering on the horizon. The 1990 World Cup saw England recording their best performance in decades and the nation's interest was suddenly piqued. A year later and, following English clubs re-entry into European competition, Manchester United captured the European Cup Winners' Cup. The landscape was changing and we hadn't even encountered the Premier League or Euro '96 yet. Football was interesting again and this new attitude was captured by Standing Room Only. Hosted by ex-Brooksider Simon O'Brien, Standing Room Only was a magazine show taking a look at contemporary football matters. Also presenting certain features of the show were Kevin Allen, Alistair McGowan and Shelley Webb. However, instead of analysing turgid matches with well worn cliches or asking footballers what their favourite music was, Standing Room Only took their cue from die hard fanzines such as When Saturday Comes. Instead of pandering to the wild xenophobia of cartoon football fans, Standing Room Only strived to portray the modern football fan of wanting much more than just an expletive ridden chant. Serious subjects such as the rise of facism in the newly reunited East and West Germany were certainly never covered by Saint and Greavsie. Did Jimmy Hill ever present a feature on the rising number of female fans? Perhaps he wanted to, but the majority of mainstream football shows were interested in nothing more than analysis and old boys humour. Standing Room Only, however, wasn't afraid to tackle these curious subjects and put them under the spotlight. The show, though, wasn't purely a po-faced highbrow dissection of football. 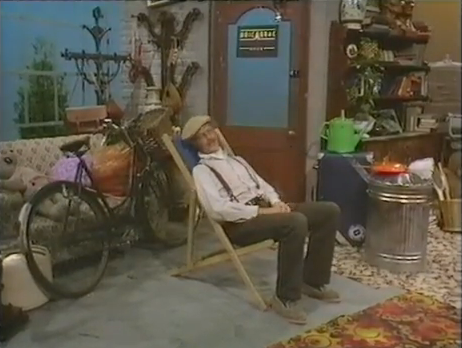 There was still a laddish spring its step and this was epitomised by the rich vein of humour running throughout. Notably, David Baddiel and Rob Newman contributed sketches to the Sepp Maier's Comedy Shorts section to give the show a nice combination of funny and smarts. The satirical swipes, a mainstay of fanzines, was also present in the form of Guardian cartoonist Steve Bell's hard hitting animations. Broadcast as part of BBC2's Def II strand Standing Room Only was produced by the BBC's Youth and Entertainment Features department which was headed up by the honking estuary tones of Janet Street Porter. 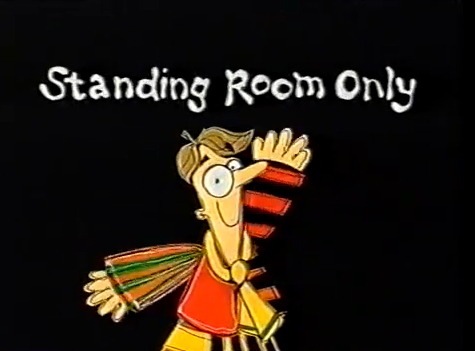 Between 1991 - 94 around 40 episodes were filmed including specials on the 1994 World Cup and the show's award ceremony - the Platinum Parrots. 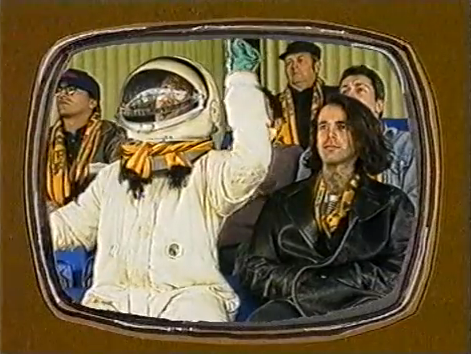 The series has never been repeated, but clips from the series were featured in the 1995 BBC2 series Natural Born Footballers. Standing Room Only coincided nicely with our entry into the world of being a football fan and wanting to know a little bit more about this seemingly simple game. Usually warmed up by an episode of The Fresh Prince of Bel Air we were captivated by the depth of this fascinating world sport. And who were all these past stars they interviewed? Michel Platini? Never heard of him, mate, but we'll listen anyway as he looked good in his prime. The humour was sublime and one sketch which always sticks in our memory featured a wild Liverpool fan stuck in a timewarp of past successes being restrained by a photo of great player, but terrible 90s manager Graeme Souness. Unfortunately, we found it impossible to find anything online about the show. 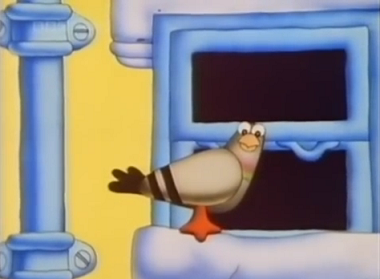 However, this was purely down to us thinking the show was called Sick as a Parrot - which, it turns out, was a curious children's crossword puzzle show. Once we had the correct name firmly ensconced in our memory it was time to investigate. Only a few clips exist online, so we headed straight for the BFI who hold copies of the entire series. Donning our scarf and football rattle we sat down to watch the very first episode. The first thing that struck us was the depth of intelligence at play. 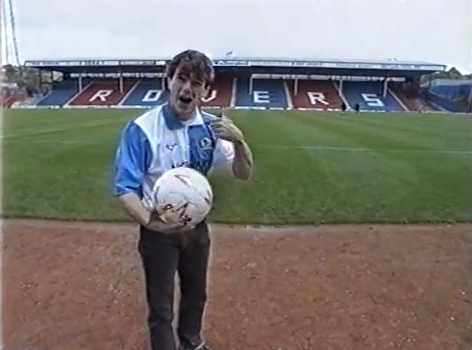 Aimed at the teen market, it was remarkably clever and not like any other contemporary football TV shows. It's fair to say that the show appealed to much more than a teenage demographic as, even now, we couldn't help soaking it all up. Simon O'Brien is indicative of the new face of the terraces. 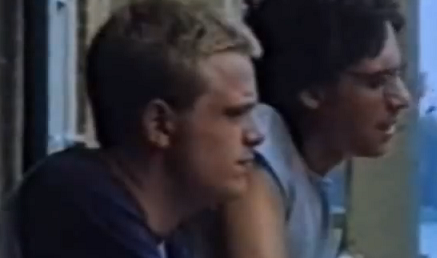 He's got the hair and look of your typical scally, but there's a deep love and respect for the game at his heart. And not a Stanley knife in sight. 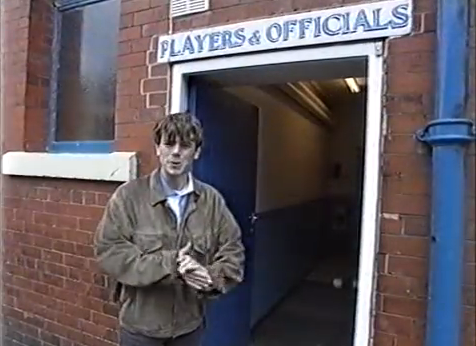 Sure, you could mistake him for someone in an indie band, but the connection between football and music in the 90s got bigger and bigger as the decade went on. Oasis loved Manchester City, Damon Albarn was always seen at Stamford Bridge and who remembers that little ditty Three Lions? Giving fans the chance to voice their views is a great feature and one that - radio aside - had been sadly lacking on TV. It was further evidence of the desire to unleash the passion previously limited to the confines of fanzines and the terraces. And the Fan Stand and Supporterloo sections kept that DIY ethos of fanzines alive and well. The humour, although 20 years old, still holds relevance as it battles the establishment and sums up the highs and lows of being a fan. Quirky little features such as 'Screen Gems' which showed clips of footballers trying, but failing are also timeless in their hilariousness. Standing Room Only was an amazingly cool show which mixed the laddish love of football with a deep and insightful analysis of the romance behind being a football fan. Football's a funny old game, but the cultural impact it's had on the planet can't be underestimated and contains such depth that a thoughtful analysis is always appreciated. Three series is a great run for any TV show, but why did it stop just as football was starting to explode into the billion dollar industry it now is? It's a real shame as there hasn't been anything like it since. Fantasy Football League was a similarly magnificicent show, but that was purely rooted in the realms of comedy. We've had enough of Sky's Monday Night Football and Match of the Day. We want something that's going to make us think and look at the bigger issues in football rather than Goal of the Month. And please get in touch if you have any recordings of the series! The life of a doll can be a varied profession. Certain dolls - particularly hideous and creepy ones - find themselves trapped within the confines of display cabinets in the garish front rooms of fifty-something women. Other dolls - usually with names such as Blinking Belle (we're a marketing genius, oh yes!) - spend their days being cared for and chewed on by little girls. 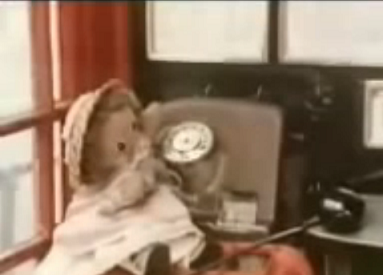 One doll, though, by the name of Ragdolly Anna had a much more interesting career. Ragdolly Anna lives on the first, second and third floor (God knows what the rent's like) of a flat with the little dressmaker (Pat Coombs). They're not alone to bicker about who's turn it is to make a cup of tea, although the dressmaker is the only one physically capable of such a task, as they're joined by the dressmaker's dummy and the wise white cat. Together the four of them embark on adventures which are simultaneously gentle and surreal. Take, for example, the second episode of series 1. It all starts off quite delightfully with the little dressmaker (she's not that little) and Ragdolly Anna renting an allotment patch. Before you know it, though, Ragdolly Anna is making friends with a talking scarecrow. Soon enough, she's only gone and make a cape and tin hat for the old straw stuffed idiot. 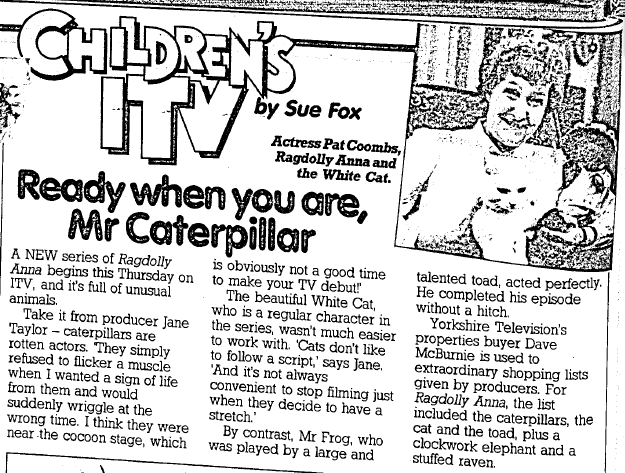 Based on the stories written by Jean Kenward, Ragdolly Anna was produced by Yorkshire Television between 1982 - 1987 and clocked up a total of 30 episodes. 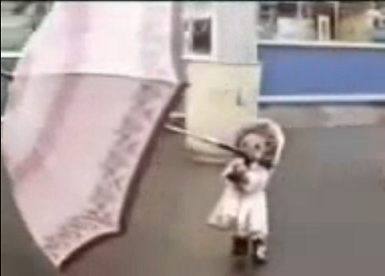 Interestingly, the show used chromakey technology to provide more animated action from Ragdolly Anna. 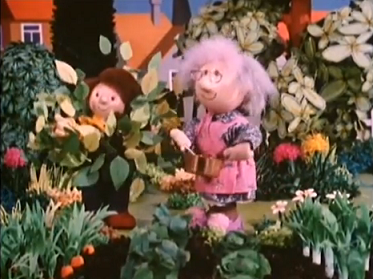 For the majority of the show, she was nothing more than a handpuppet but certain sections used chromakey to shrink a real life person (played by Michele Davidson/Caroline Berry) in a Ragdolly Anna suit into the action. When they weren't indulging in bluescreen magic, the producers used a mixture of live action and static photos to tell the stories. The series was directed by Doug Wilcox and John Allen. Interestingly, the series was sold overseas and appeared on Malaysian TV under the Channel 5 umbrella in 1988. Dolls Aren't Just for Girls! Yes, that's right! We loved Ragdolly Anna as a young boy and we're not ashamed to admit it! We can justify this as we feel any child - male or female - can relate to the show. Ragdolly Anna is the child of the piece, the little dressmaker is the mother and the white cat is, for all intents and purposes, the grandmother. 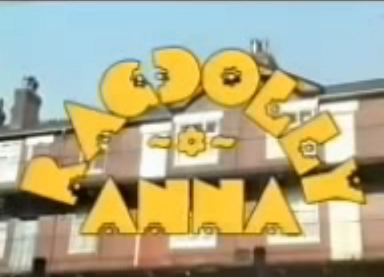 Look at the very first episode of the series where Ragdolly Anna is sent out to get some bacon. Like a good child, wanting to please their mother, Ragdolly Anna sets out, but soon becomes lost. It's every child's fear that they'll get lost and seperated from their parents, so it's easy to see how this could engage them. Admittedly, Ragdolly Anna gets trapped down a drain and then rescued by a frog, but the main thrust of the story is something that a child could relate to! Watching it back now - the BFI Archive is the only present option - we were still enthralled by it as there's a captivating mix of simplicity and wild adventure at play. The one thing that did disturb us slightly, though, was the chromakey doll sections which reminded us of the evil doll from Terror of the Autons too much. Finally, the Ragdolly Anna theme tune is an amazing piece of music hall piano which rolls along with horns beefing it up. It's like a lost slice of Ray Davies or Syd Barrett at their British storytelling best. C'mon Network DVD! RELEASE THE ENTIRE SERIES! Certain names leap out at us when we're researching TV shows and receive a huge tick in the "BLOODY REVIEW IT ASAP!" box. Michael Cole is one of those names. 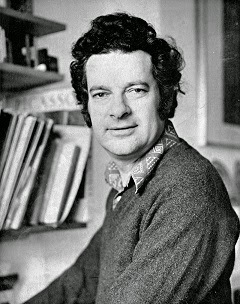 With a huge array of talents at his disposal he managed to write, direct and produce some of Britain's best loved children's shows throughout the 1970s and 80s. Our own childhood was lit up by afternoon viewings of Gran, Bric-a-Brac, Chock-a-Block and Pie in the Sky, so we felt it only right to dedicate a post to his amazing talent. Michael found himself born into Willesden, London in March 1933. It was an unfortunate time to be born with World War 2 only a few years away and, sure enough, Michael was evacuated to Cheltenham in 1940. Following a stint of national service where he studied Russian at Cambridge university in order to train as an intelligence officer, Michael moved into advertising. By now, though, Michael was married to Jo and starting to get itchy feet about Britain and writing copy. So, in 1962, they moved to Tourette, Provence in France. It was here that Michael and Jo's creative relationship really started to flourish. The first fruit of which was Bod. 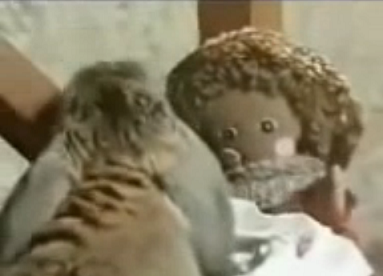 The adventures of an enlightened young boy, Bod, was the Coles' attempt to create a children's character with a more enduring appeal than Noddy . Back then, of course, Bod was merely a character to keep their children entertained. 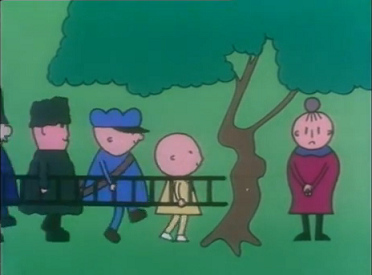 However, maybe Bod was engaging enough to entertain other people's children too. Michael and Jo worked hard at developing Bod and, in 1965, the stories were taken up by Methuen and published . This first flush of success was soon followed by Michael starting work at the BBC in 1967 and, very quickly, he found himself directing Play School. This proved the perfect arena for Bod to make his televisual debut, so the Bod stories were soon being read out on Play School. Spoken word renditions of Bod were all well and good, but they didn't satisfy Michael's Bod shaped vision, so he and Jo soon began to devise a fully animated TV show. Forming a production company - Bodfilms - with David Yates, the trio were able to start production of 13 Bod episodes in 1975. 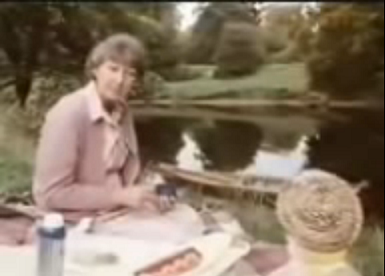 Starring the beautiful tones of John Le Mesurier and Maggie Henderson, Bod was backed by music from Derek Griffiths. The show was a huge success and repeated until 1984. Bod had been very successful, but Michael still had plenty of tricks up his sleeve. 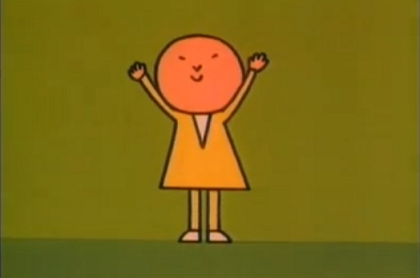 Prior to the animated version of Bod, Michael and Jo had created the surreal and imaginative Fingerbobs which used finger puppets to mix song and adventure in the Watch with Mother slot. 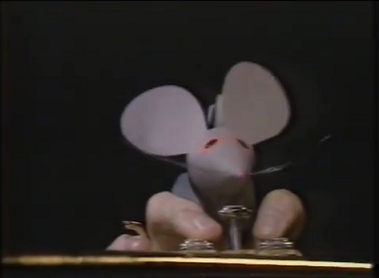 Fingerbobs also spawned the 1985 spin-off series Fingermouse. Michael's initial tenure on Play School led to a long and successful working relationship with executive producer Cynthia Felgate. The pair had a talent for creating shows aimed at preschoolers which combined learning with fun such as Ragtime, Bric-a-Brac, Chock-a-Block and Playbus. Out of this relationship, Michael managed to rack up show after show in the 1970s and through into the 80s. With shows under his belt such as Pigeon Street, Over the Moon, Stop - Go, series 1 of Postman Pat and all the others we've mentioned, it's fair to say he more or less owned the See-Saw slot. Michael had already laid out quite the legacy, but an uncertain future awaited him. Sadly, Michael became a widower in 1985 following the death of Jo. Considering the close working and family relationship they had built, it could easily have crippled Michael's energy. Nonetheless, Michael found that life went on and created the Dot stop for Play Bus and ensured his name remained on screen. 1988 saw further hardship, though, when Michael was involved in a car crash. Doctor's were not confident of a recovery and predicted permanent brain damage. However, Michael's determination meant that he managed to not only teach himself to read and write again, he also created further TV shows in the guise of Alphabet Castle and Tinysaurs. And happiness wasn't just limited to his continued success within the confines of TV. Michael was struck by Cupid's arrow once again and married his second wife Pam in 1993. They spent eight happy years together before his death at the age of 68. 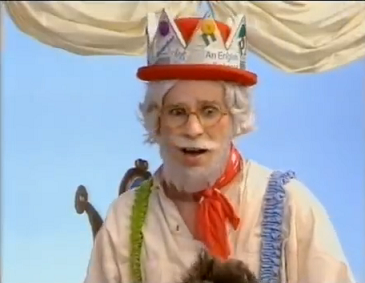 A young age to go, but one where his status as a legend of children's TV had long been secured. Why Do We Love Michael Cole? Back in the mid 80s we had absolutely no idea who Michael Cole was, but the shows he worked on embedded themselves in our mind for decades. Nearly all the children's shows that we remembered most vividly - Bric-a-Brac, Chock-a-Block, Gran and Pie in the Sky - featured Michael's involvement and illustrates how much magic he could bring to television. They were important shows which taught us about language, song and an overall joie de vivre - I mean, who can't take solace from Gran that pensioners carry on having fun? In fact, older characters such as Gran pervade Michael's work and we feel that this helped endure his shows to children. With grandfatherly characters such as Brian Cant in Bric-a-Brac it imbues you with that same fuzzy feeling you got, as a child, when visiting your grandparents. When a bag of sweets was never far away and something ancient and interesting would be brought out from a dusty cupboard to look at. It's a testament to Michael that his shows are now ancient and interesting curios that deserve special attention. 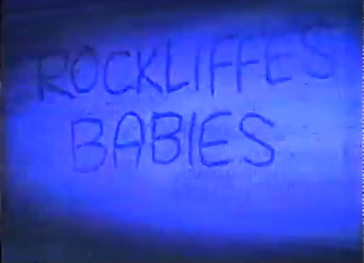 We can only pray that the BBC honour this at some point with a retrospective. 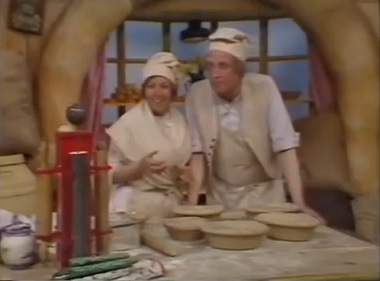 Delving deep through the past of British telly has provided us with some utter delights of entertainment. What is it though that kick starts each amazing journey for us? Sure, it's usually a glass/bottle of scotch, but what if we're talking content wise? Yes, that's right! It's the humdinger that is AN AMAZING THEME TUNE! Today, then, we're going to share five of the very best we've uncovered! Hear the theme tune here! Gary Shail's theme tune uses just a flute and acoustic guitar, but manages to encapsulate those formative years where a boy becomes a man. It perfectly reflects the indecision, frustration and sadness that haunts the titular character over the series.One where he struggles with unemployment, the mundanity of life and death. One of the episodes features Lipton's band rehearsing a version of the song with lyrics, but the theme uses just an instrumental version. A shame as the lyrics really paint a picture of what Johnny becomes. Nonetheless, the instrumental version is fantastic and utterly, utterly impossible to resist whistling. Who says that only humans deserve an amazing theme tune?! Dinosaurs are just as entitled and, boy, what a theme tune they get! No! We're not talking about Jurassic Park! 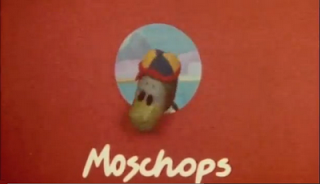 We're talking about Moschops! Daryl Runswick created a masterpiece of prehistoric rock and roll which is packed full of bluesy licks and traditional scale work. Also featuring is an impressive array of instruments taking in clarinets, recorders and Runswick's own invention, a piccolo bass guitar. We chatted to Daryl Runswick a few years back about the theme tune and he revealed it was recorded, along with the series' incidental music, in just 3 hours! A chorus of disenchanted youths start singing a paean to council estate life as lively saxaphones come straight to the fore. Bloody hell! It doesn't get more 80s than this! Your mum's on the social , dads in the dock"
"When Dads let out your mother will fall. You'll have a kid sister, cradle and all." They're not intrinsically linked to the main characters in any way which is a slight criticism, but it's a mesmerising piece which captures the environment the 'babies' are working in. 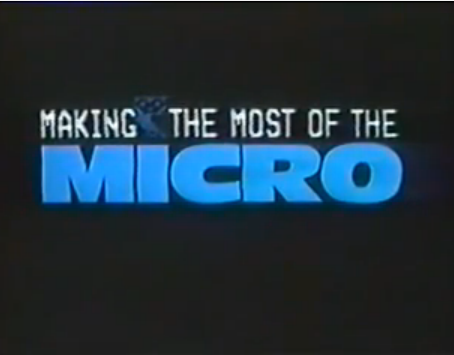 1982's The Computer Programme had a fantastic brooding, grime filled synth score to open the show, but 1983's spin off Making the Most of the Micro tops even this. A more lively and haunting piece with a sense of urgency pulsating through its veins means it's one of our favourite synth led theme tunes. If you can imagine The Tripods theme and the Doctor Who theme coming together for a night of electronic passion, then this is the love child! Roger Limb - stalwart of the Radiophonic Workshop - created the piece and has absolutely knocked our socks off with it. 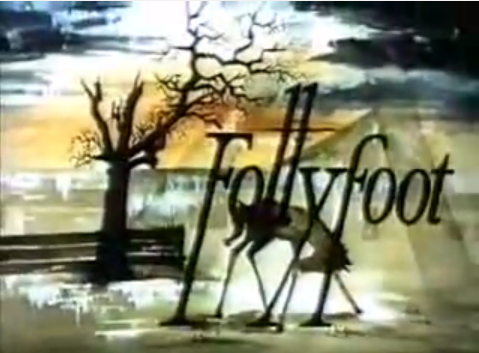 It's back to the 70s to discover just how much effort went in to creating theme tunes with Follyfoot! Steven Francis aka Francis Essex aka brother of Follyfoot writer was tasked with composing a theme tune which would resonate with equine themes and children's imaginations. With a vision as grand as the show's cast, crew and plotlines, Francis conjured up a majestic and sweeping cinematic theme tune. Starting off with eerie haunting vocals reminiscent of a late 60s psych love song, strings soon begin to soar as the vocals beg the 'lightning tree' to grow and keep dreams alive. If only kids shows today had such epic theme tunes then perhaps the future would be a better place.